Summary: "Leena Thomas’s senior year at boarding school starts with a cruel shock: Frost House, the cozy Victorian dorm where she and her best friends live, has been assigned an unexpected roommate—eccentric Celeste Lazar. From debut author Marianna Baer, Frost is a stunning and surprising tale of suspense that will have readers on the edge of their seats." First Line: "Before I lived there, before any of this happened, I imagined Frost House as a sanctuary." Thoughts: Normally, I'm not a huge fan of ghost stories, but this one amazed me. 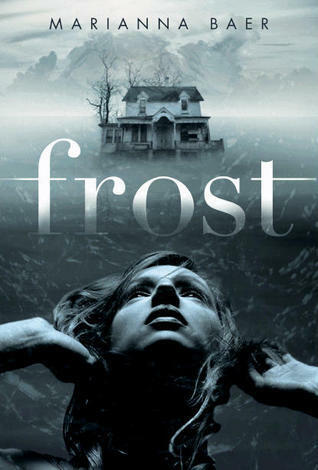 Creepy, eerie and addicting, Frost is one of those books that will haunt you days after you've already finished it. Be sure to check your closet, lock all the doors and windows, and have your night light ready because the fun is just about to start. It's Leena Thomas' senior year, and she couldn't be more thrilled. Not only is it her last year of high school, but she also gets to live in Frost House with her 2 best friends. Out with the dorm drama and in with the family closeness! But, as you know, not everything ever turns out the way you want it to. Celeste Lazar, drama queen extraordinaire, broke her leg over the summer and with dorms being too much for her to maneuver around, she is placed into Frost house and becomes Leena's roommate. Not cool. On the bright side, Celeste's gorgeous brother David has just enrolled into their school and with Celeste's broken leg, is around quite often. Bow chicka bow wow! Totally kidding, but the chemistry is there and pretty amazing. The only thing is, David is extremely protective of Celeste and the closer David and Leena become, the more Celeste pulls away yet demands attention. Oh, drama...how I love it so! To top it all off, bazaar things begin to happen at Frost house. From broken vases, to torn clothes, and even pictures falling off the wall, something just doesn't feel right. Celeste blames Abby, Abby becomes defensive, and Leena starts making up excuses like the wind, even though it hardly makes sense. The roommates begin to divide, secrets about the Lazar family begins to unfold, and soon, Leena will begin to question whether Celeste is doing all of this for attention, whether her best friend is really that callous or if the truth is more frightening than anything she could possible believe. One thing I loved about this book is how the relationship between David and Leena blooms. It wasn't just an insta-love type of situation. They actually got to know each other and develop a relationship rather than jump head first because it feels right. With so many "love at first sight" books out there, it's a breath of fresh air to find a book where the romance feels real and solid rather than just using fate. Also, the story telling is phenomenal. Even when nothing was happening, I found myself completely engulfed in the story. I actually stayed up till 4am just so I could finish it. It's one of those books where even though there's the backdrop ghost story, there's also a great contemporary novel mixed in, too. I would have liked to see a little bit more of the creepy factor, but there was still enough to keep me interested and invested. The character development is sensational. You never know who to trust, and let's face it, life stinks when your friends become your enemies. I do have a couple complaints, though. As far as the ending goes, it felt a bit rushed and left me somewhat unsatisfied. I felt like the questions I had where not answered. Instead, ended a bit vaguely, making the reader come to their own conclusion. Some people love these kinds of endings, but personally, I don't care for them. I'm just the type of person that loves concrete answers as oppose to the abstract. Also, Leena...oh sweet girl, you're spelling your name wrong! Silly complaint, I know, but from one Lena to another, I simply must share it. Overall, for those who love ghost stories and even for those who don't, I recommend checking out Frost. If you are a fan of detailed characters, real life problems with a handful of paranormal activity, this book is right up your ally. Watch out for roaches, broken glass and backstabbing because all this and more is headed your way! hi! i follow your blog! i want to read this book soooo bad! just stopping by :) i have cool pics on mine today that remind me of dark YA. ooooh, I'm intrigued. I love ghost stories, there's not that many of them out there. I do mine really creepy though but if it comes with great story telling I'm in. I know what you mean about those unresolved endings, with me it depends on how I felt about the book while reading it. Sometimes I don't like those if it's like the ending of a series or it leaves lots of questions unanswered but I'm definitely intrigued to give this one a try even more so since you stayed up until 4am reading it. =D Great review Lena! I've totally been into the ghost thing these days. I'm loving it way more than vampires and werewolves.